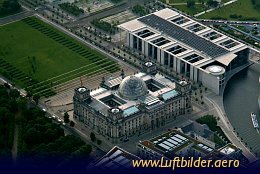 The Reichstag building in Berlin was constructed to house the parliament of the German Empire. 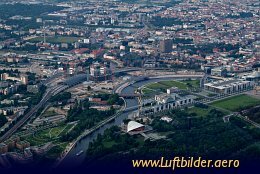 It was opened in 1894 and housed the Reichstag until 1933. 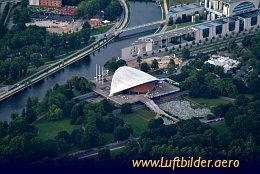 The former congress center, called ''Pregnant Oyster'' by the Berliners, today harbours the House of the Culture of Nations. It was built in 1975 as a contribution of the United States to the international exhibition of architecture. In 1980 the front wall crashed in an accident. The hall was rebuilt despite many discussions around it. Lehrter Bahnhof is now Berlins main railway station. It began its operation in May 2006. On the picture it is still under construction.